We pride ourselves in providing our St Charles clients personal attention and the highest standard in residential electrical services. Our commitment to quality and integrity has enabled us to achieve success in Northern Illinois which is reflected in referral business from our Illinois clients. Blumhardt Residential Electric provides the latest and most efficient electrical products for you home or office with a licensed electrician. 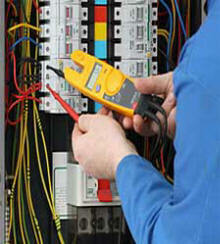 Our commitment to service and our affordable pricing separate us from other electrical contractors. Call Now to Learn How we Can Help!